Memento Mori in 19th century America: the death of Irish emigrant Mrs Fagan. I have just been reading a very fascinating blogpost by Damian Sheils of the Irish in the American Civil war about a man called James Fagan. James who was born in Athlone, he emigrated from Ireland, fought with the 3rd US Infantry in the American Civil War. As I read through the post, I came across a fascinating pieces on the death of his wife which immediately reminded me of the film The Others, where the character Grace played by Nicole Kidman, finds a ‘book of the dead’ an album of Memento Mori style portraits also known as post-mortem portraits, of deceased corpses. Following his wife’s death, James Fagan had a post-mortem photograph commissioned of her body posed in a coffin. Although this may sound macabre to modern ears this was at one time a perfectly normal occurrence. Post mortem photography involves the photographing of the deceased, often in their coffins or posed as if sleeping. 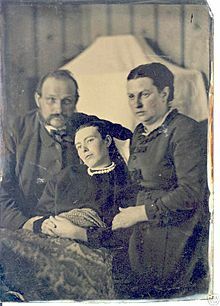 The corpse was often posed beside living family members. This practice very popular in Europe and but less so in America during the 19th century. The body was propped and eyes opened all in an attempt to make the corpse life like or positioned to look as if sleeping. I must confess that any of the images of post-mortem photography I have seen make me uneasy, there is something so sad and heart wrenching but at the same time truly creepy about these photos. These photographs provided family members with a keepsake and a way remember the deceased. Mortality rates were very high for children during this period so these photos were especially common for infants and young children, who were posed to look like they were sleeping. This was often the only image the parents had of their child and was a treasured possession. According to Wikipediea ‘The practice eventually peaked in popularity around the end of the 19th century and died out as “snapshot” photography became more commonplace, although a few examples of formal memorial portraits were still being produced well into the 20th century‘. The picture was unusual as James Fagan looked distressed in the photo ‘the expression of this face was untranslatable‘. Any of the photos I have seen which have living adults the expression on their faces are always solemn but never expressive. Thus I can understand how those who saw the photo would ‘never forget it‘ most likely because of Fagan’s expression. What was also interesting was the fact that a saucer of soil from Ireland was placed at the head of Mrs Fagan’s coffin. It seems that James or his wife when leaving Ireland had brought some earth with them to their new home. The saucer of earth was most likely buried with Mrs Fagan. I wonder how many of those who emigrated would have taken a physical part of Ireland within them? The majority who left Ireland in the 19th century especially around the time of the famine would have had few possession and a piece of soil would have been easy to obtain and pack. According to the Irish company Auld Sod Exporting Company who exports Irish soil to America, many modern Irish emigrants have a desire to be buried with a piece of Ireland . The company’s website notes that it was common for 19th century emigrants to take some soil with them when leaving Ireland. These customs although strange to the modern world must have brought comfort to the families left behind and were for them a valid way of remembering the dead. This entry was posted in Uncategorized and tagged 19th century Post Mortem photoss, buried with soil from Ireland, funerary customs of the 19th century. ← Gravestone recording at Ballylanders, Co Limerick. Your welcome, Im not sure about the death mask. I think as photography developed and more prints could be printed from negatives the photos were sent to familiy members kind of like memorial cards. I remember reading that St Leo’s Bell on Inishturk was broken up and pieces taken by islanders emigrating in the 19th century. Really interesting post! !